HomeBlogLost 3-year-old NC Boy Tells Mom he ‘hung out with a Bear for Two Days’..Was it a Bear, imagination or something else? 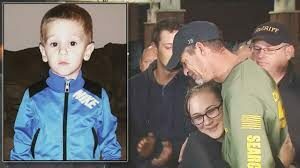 The 3-year-old boy who spent two days lost in the woods of eastern North Carolina tells his mother he “hung out with a bear” for companionship while hundreds of people searched frantically in cold and rainy weather to find him. His mother, Breanna Hathaway, shared that revelation on Facebook Friday morning, adding that Casey “is healthy, smiling, and talking” after being found late Thursday night. The post has gotten more than 400 comments and nearly 2,000 shares through the day. Casey spent Thursday night being examined by doctors at CarolinaEast Medical Center, and hospital staff said Friday that he was “in good condition and will be released later today or tomorrow,” according to TV station WBTW. The New Bern Sun Journal says the 25-pound boy ”was wet, cold, and scratched up…but speaking” when found by rescuers who waded through “waist-deep” water.